Have you been grocery shopping lately? I go once every week or two. I hate grocery shopping and try to buy as much as I can each trip so that I don’t have to go back so often. But it is expensive to get sustenance! Basic necessities like coffee and peanut butter have increased significantly in price! It is time to perhaps reaquaint ourselves with the bulk bins. If your grocery store doesn’t have bulk bins (like Safeway, Albertsons, Thriftway) it is probably worth your time to find one that does. I really used to detest shopping at WinCo, but the truth is they have way better prices than several other stores. Here on the West Coast, Fred Meyer is a terrible place to buy groceries…very expensive. Here in S. Oregon, even though I really dislike shopping there, I shop at our local Food 4 Less. It really is food, for less. Both WinCo and Food 4 Less have bulk sections, as do most co-ops. Today when I hit up the grocery store I decided to spend a little time in my bulk food and natural food sections. There are some crazy deals! 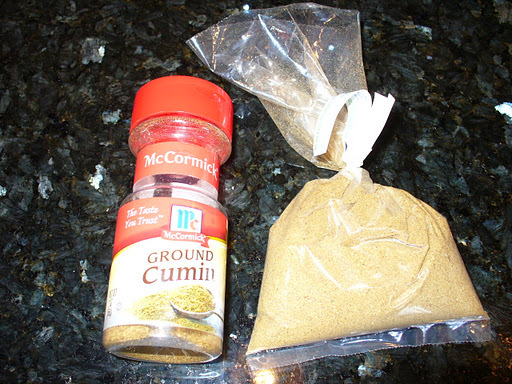 This is a 2 oz container of McCormicks Ground Cumin. It will cost you $2.49 at Food 4 Less. The little baggy? It is 2.5 oz of ground cumin from the bulk bin. I paid .70 cents for it. 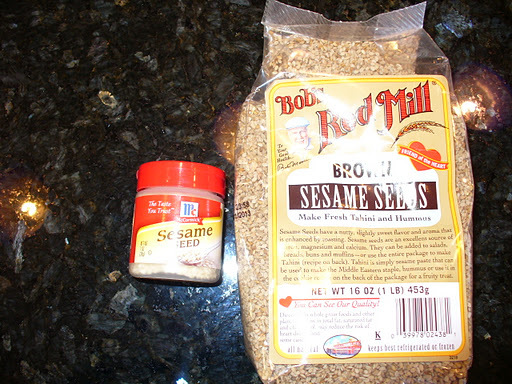 Here is an even more crazy example: little jar of white sesame seeds is 1 oz. It will cost you $4.98 (!!!!) at Food 4 Less. See that 16 oz (!!) bag of brown sesame seeds next to it??? $4.49. Is that racism against the brown seeds or what? I don’t know! But seriously, 16 oz vs 1 oz for almost .50 cents LESS? Craaazay! I didn’t notice much difference in the price of coffee. I paid $4.48 for a large jar of Adams natural peanut butter today, but next time I am going to look and see how much it costs to get the same amount from the “grind you own” machine in the bulk section. If you haven’t been to a WinCo, or Food 4 Less or some other warehouse style grocery store lately, and you are feeling the pinch of your grocery bill, it might be worth your while to stop by one, look around and check out the prices. Remember, buying in bulk, like meat, really does cost you less! Buy the huge family pack of chicken breasts, and separate them and individually freeze them. Don’t pay for convenience and packaging if you don’t have to. Take a little bit of time and save yourself real money! What do you do to cut down on your grocery costs? Do you shop in the bulk section? 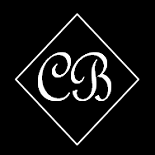 This entry was posted on October 16, 2011 by Corrie Beebe in food, shopping.